Multiple recalls of the new 2013 model Escape are starting to raise eyebrows. The all-new 2013 Ford Escape is a bold departure for the previous model. Is this a cause for concern? When automakers introduce an “all-new” car the truth is that it is almost always a lie. Automakers have learned the hard way that if they introduce a new chassis, a new infotainment system, a new engine, or a new transmission, that they do have some risk of problems. Handling these problems is part of the cost of doing business. To be safe, most manufacturers now carry over either the drivetrain or the chassis (body, suspension etc) and the car is usually only half-new. Warranty and recall procedures keep the customers safe and happy, and the model eventually works through the minor glitches that almost any car can suffer. However, if an automaker has the daring to change all of these things at once the small problems with each system can reach the tipping point and the car can be labeled a lemon. Ford has made that gamble with the 2013 Escape and it really is "all-new." 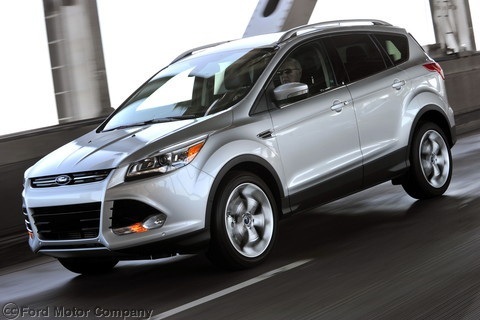 The 2013 Ford Escape is a fantastic automobile. At Torque news we have reviewed the vehicle and our analysis has been a thumbs-up. This author has driven the vehicle and found it to be a game changer in the class. That said, we did have concerns that should be noted. One of the novel features of the 2013 Escape was the automatic rear hatchback. When mom waves her foot under the rear bumper the tailgate ascends as if she has used the Force. During our testing that feature did not work. We chalked it up to an early model. Perhaps even a pre-production mode. However, the recalls are starting to mount. Ford today recalled the 2013 Escapes that have its best engine, the 1.6 liter EcoBoost turbo, saying it may have a fuel line problem that could cause a fire. Ford issued a press release stating “As an additional safety precaution, customers who already own 2013 Escape vehicles with the 1.6-liter engine are being advised to stop driving their vehicles and to immediately contact their dealers. Dealers will deliver a loaner vehicle to these customers and will transport their 2013 Escape to the dealership for the necessary repairs. The company is working to make parts available as quickly as possible and customers will keep the loaner vehicle at no charge until the repairs on their vehicle are completed.“ The words “stop driving” and “Immediately” are not words that a customer just receiving their first payment reminder is going to be happy to hear. Click here for a look at the new Escape engine fire recall. This is not the first recall of the 2013 Escape. The vehicle has also been recalled for braking problems. That recall seems almost unforgivable given that it is eerily reminiscent of the carpet obstruction issues that have caused Toyota so much recent pain. Making things even tougher for Ford, the previous generation vehicle has also now been recalled for unintended acceleration problems. Although that car is almost entirely different than the current one, more bad press with the words “Escape recalled” is not a good thing. Ford quality is world-class, and when it chooses to Ford can make the highest quality products in the market, as proven by its number two ranked Lincoln brand in last year’s J.D. Power Initial quality survey. Ford also took Jaguar and Volvo, both brands that struggled with poor attention to detail for decades, and turned them into fantastically reliable brands – and then sold them at a loss. Ford can make this right, and it will. The only question is will the Escape be branded as a problem-car? My Ford is a total lemon. Ive had so many repairs its not even funny. The transmission is currently blown out. Its sitting at the dealership until they can figure out what went wrong, really. This vehicle has been in the shop at least 20 times for major repairs. No more Fords for my family. Our 2013 Escape has been in the shop since the day we got it... Now we need a new transmission. They want $6,000 for it... This is our 3rd ford and we will never own a Ford again!!! My 2013 is at dealer with broken transfer case and transmission fell out due to loss of bolts. Hopefully powertrain warranty will cover it. And the thing about this is; I LOVE THIS CAR! Like, this is my dream car! Since day one I can remember I test drive the Ruby Red Ford Escape, and it was perfect. I fell in love! Thats why this really hurts when Chester (My Escape) keeps having issues. That, and I'm a college student and CAN'T afford these expensive car repairs! I bought a used 2013 Ford Escape with 76.000 miles and had to do a Repair because it had a antifreeze leak that caused the Engine to heat up and stall the water pump had to be Replaced at 870.00 Engine check light is still on.